At the height of winter, when trees stand naked, streams and lakes freeze up, and the landscape is wrapped in snow, the woods of the Chicago region seem lifeless. With only the sound of wind and the occasional call of a crow, nature apparently has slipped into a seasonal coma. But if you happen to take a winter hike a couple days after a fresh layer of snow has fallen, you’ll realize that you’ve been fooled into equating winter with total dormancy. Fresh snow soon gets crisscrossed by an array of critters: raccoons, foxes, coyotes, rabbits, chipmunks, deer, and a variety of birds. The imprints of paws, hooves, and claws reveal bustling neighborhoods within the woods. Hunting for animal tracks in the snow is just one of many simple pleasures to be enjoyed on a winter walk. People hike in winter for a variety of reasons: some seek solitude and some go out looking for a cure for their cabin fever. Others go for the sights and sounds: snow hanging on tree boughs, the wind sweeping through bare trees, and chickadees flitting among branches. Whatever your reasons for getting out, the first step is finding the right place to go. 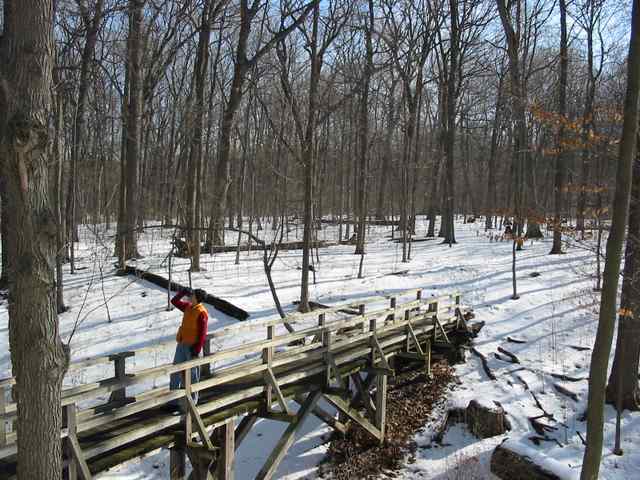 Here are a few local spots perfect for winter hiking. At the Morton Arboretum tree lovers could be kept busy for weeks surveying hundreds of types of trees grouped according to geographical origin, species, and habitat. While the arboretum is known for its woody vegetation, the woodlands and savannas are also great places to look for animals and their tracks. For a 3.4-mile counterclockwise loop hike through the east side of the Morton Arboretum, start at the Big Rock Visitor Station and follow the Main Trail as it heads west toward the arboretum entrance. (The Main Trail is a series of four connected loops, numbered from west to east.) Growing along the Main Trail are trees from Appalachia; plantings of locust, honeysuckle, viburnum trees; and trees from Asia, such as mock orange and koyama spruce. Birds like flickers, juncos, and cedar waxwings show up in these areas during winter. After skirting the edge of Bur Reed Marsh, you’ll enter an area with 43 types of oaks from around the world. If snow has fallen, look for spots underneath the oak trees where deer have kicked up the leaves while hunting for the acorns. Entering the dense woodland, keep an eye peeled for animal tracks within furrowed lanes in the snow: The stands of shrubs and abundant deadfall seem to draw in the critters. After completing the hike, don’t miss the favorite stop for winter hikers at the arboretum: A warm café with a view. The Little Red School House Nature Center provides a good destination for young hikers because the terrain is gentle and the trails are short. Plus, kids have a chance to warm up while they check out the funky exhibits in the nature center that once served as a one-room schoolhouse. Start the hike behind the nature center on the Farm Pond Trail as it hugs the shore of Long John Slough, a 35-acre lake fringed by oak trees. Stay to the right at the next two junctions and follow the Black Oak Trail through patches of savanna, prairie, and woodland. After hiking nearly a mile, a sign on the edge of the trail identifies the former site of the Little Red School House. First built here in 1870, the school burned down in the mid-1880s and was quickly rebuilt. In 1932 the school was moved (pulled by one mule, they say) to a location nearly one mile east, and then it arrived in its present location in 1955. On the way back to the nature center, the trail takes you by a display of old farm equipment and three large cages containing live birds of prey: a great horned owl, a barred owl, and a red-tailed hawk. Before starting the next loop, duck inside the nature center to see more live animal exhibits, such as an American kestrel (a small falcon) and a boisterous crow. Kids will want to press their ears against a Plexiglas box containing a buzzing beehive, and they’ll likely enjoy some of the mounted specimens, such as the five-legged bullfrog named Mr. Lucky. After warming up, continue the hike on the White Oak Trail directly across the parking lot from the nature center. Cross the multi-use gravel path, and then bear right at the fork. Watch for woodpeckers and chickadees moving among the trees within this gently rolling savanna. Before heading back, you’ll see Joe’s Pond, one of the many small bodies of water in the area left behind by glaciers. Among the many regular visitors to the Indiana Dunes, few have seen the dunes in winter when snow covers these monster-sized sandy hills, strange ice formations develop along the shoreline, and views are enhanced by the absence of foliage. Starting from the Indiana Dunes State Park Beach House, head to the right for a 2.7-mile walk along the beach. Look for deer, raccoon, and skunk tracks near the water. You’ll likely see some shelf ice along the shore. Shelf ice develops when the winter winds blow piles of ice against the shoreline. 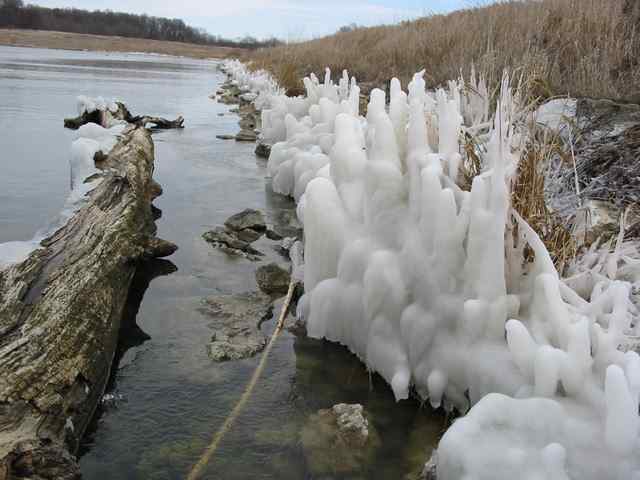 The ice freezes together forming dramatic ice sculptures, and sometimes the shelf extends hundreds of feet into the lake. (Don’t walk on the shelf ice—it’s not solid. Signs in the park offer stern reminders that falling in the water in cold weather is extremely dangerous). At the marker for Trail 10, head inland into a dune forest of oak and pine. Attentive hikers may catch a glimpse of a pileated woodpecker. This elegant, crow-sized bird with a prominent red tuft on its head is rarely seen in the region. Also, keep watch for small groups of wild turkeys crossing the path in front of you. Turn right on Trail 9, and soon you’ll come to a large blowout. A blowout forms when winds blow sand inland, carving out what looks like a large sandy amphitheatre. 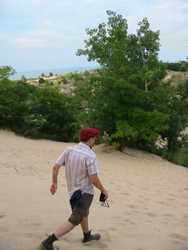 From the blowout, the trail traverses a dune ridge. Tall white pines and stately black oaks rise from the ravine on the left. Through the bare trees on the right, the Chicago skyline is usually visible 30 miles away. After passing another large blowout and then dropping down from the dune ridge, stay to the right at successive junctions for Trail 9, Trail 10, and Trail 8. Now, get ready to climb the big ones. Following arduous climbs up Mt. Jackson and Mt. Holden, you’ll enjoy views high above the treetops of the dunes parkland and beyond. Climbing the staircase up Mt. Tom rewards you with expansive views of the lake’s shoreline to the west. Trail 8 takes you down the beach, where you’ll turn left and hike back to the parking lot. Snacks and liquids are highly recommended during any walk. This is especially true in winter when a thermos of warm soup becomes a source of deep happiness. The old advice about dressing in layers still holds true: stay comfortable by peeling layers off and putting them back on. Snowshoes are generally unnecessary for local winter hikes. Even when snow is more than six inches, trails get packed down quickly. Learn more about hiking in the Chicago region by checking out 60 Hikes within 60 Miles: Chicago, recently available in a second edition. What’s outdoor recreation in Chicagoland going to be like in future years as the climate continues to change? Well, you’ve already had a taste of this transformation. Since 1980, Chicago’s average temperature has risen approximately 2.6 degrees. And according to a new report drawn up by leading climate scientists to describe various scenarios for Chicago’s climate future, the city could experience more extreme heat, heavier, more damaging rainstorms, growing flood risks, and greater loss of habitat for native plants and animals. Temperature: With 15 of the last 20 years showing above-average annual temperatures, it’s very likely that Chicago summers will continue to be hotter with a higher frequency of intense heat waves. Moreover, a likely increase in humidity could make hot days feel even hotter. By mid-century, Chicago’s climate could resemble that of Baton Rouge, Louisiana, with summer temperatures reaching 90+ degrees on more than seventy days and 100+ degrees on more than thirty days. Precipitation: As anyone who owns a pair of cross-country skis can attest, we’re already experiencing less snow in winter, and an earlier snow melt in spring. In years to come, expect more flooding and erosion as downpours increase in intensity. This could lead to trails getting washed out more frequently, and will likely create long-term trouble for parks and preserves prone to high water from nearby lakes and rivers. Plants and animals: Those who enjoy identifying wildflowers and watching local wildlife may have already seen some changes happening in local ecosystems. Chicago’s “plant hardiness zone,” as it’s called, shifted to that of central Illinois in 1990. If left unchecked, plants from northern Alabama will be very comfortable growing in the Chicago region by the end of the century. Of course, when plant species go, the creatures that feed on those plants follow. There is overwhelming scientific consensus that climate change is mostly a human-made phenomenon resulting from the emission of greenhouse gases. Of the two main sources of greenhouse gases in Chicago, 70 percent of the gas emissions come from buildings or the energy production needed to serve them. Another 21 percent comes from the burning of fossil fuels to operate cars, trucks, buses, and trains. 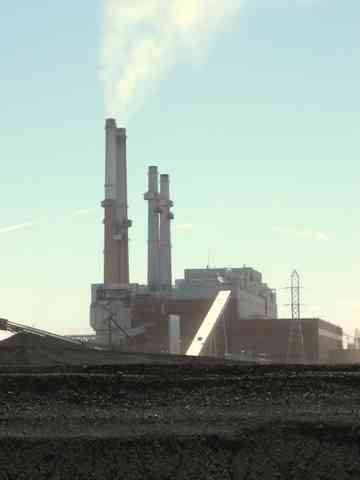 Most of the remaining greenhouse gas emissions come from waste and industrial pollution. The Chicago Climate Action Plan states that the timeline for these changes depends on future levels of greenhouse gas emissions. The authors make it clear that there is time to lessen or even eliminate some of the negative effects of climate change in the Chicago area. In addition to laying out larger goals and action plans for business and government, the report offers plenty of suggestions for individuals. 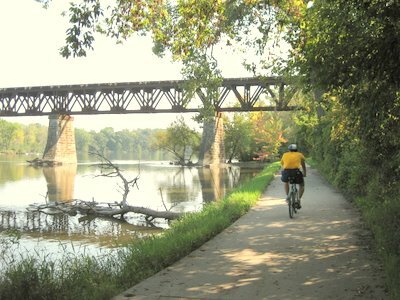 Located only 30 miles west of downtown Chicago, the Fox River Trail has plenty of good things going for it. As this pathway hugs the Fox River for 33 miles between Aurora on the south and Algonquin to the north, it passes more than a dozen community parks and forest preserves. These quiet riverside parks offer great views of the big winding river. In Elgin, the Fox River Trolley Museum sits alongside the trail. 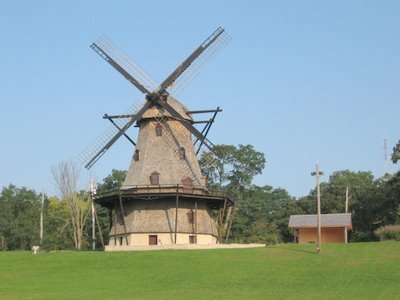 In Geneva, the 300-acre Fabyan Forest Preserve contains a restored Dutch windmill that dates back to the 1850s. 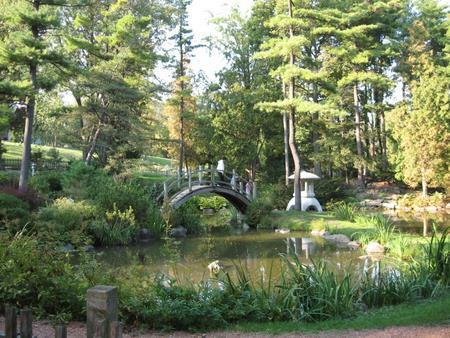 Also alongside the trail at Fabyan are a pristine Japanese garden and the Villa Museum, designed by Frank Lloyd Wright. Along with the natural and historic attractions, the trail also passes through a string of enjoyable downtown areas. Some of the towns—particularly Elgin, Geneva, and Batavia—have done great work in creating attractive urban riverfront areas with flower and sculpture gardens, pedestrian bridges, and scenic walkways. Since you’re never far from one of the nearby towns, there is usually a variety of restaurants, ice cream parlors, and watering holes not far down the trail. In East Dundee, you can choose between two locally-owned trailside coffee shops. The Dutch windmill at Fabyan Forest Preserve. 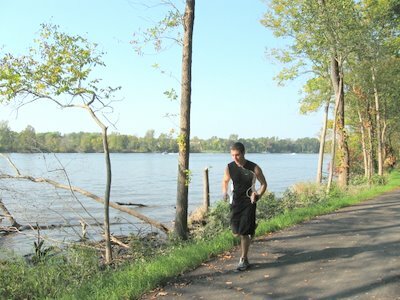 If you’re keen on a longer trip, the Fox River Trail allows you to connect with a handful of other Chicagoland recreation trails. Heading north, for example, will connect you with the Prairie Trail, which will take you all the way to the Wisconsin border. And finally, the gamblers among us will be happy to know that the Fox River Trail might be the only long recreation path in the nation with two riverboat casinos located steps from the trail. Nearly the entire Fox River Trail is paved; only a few short sections are covered with crushed gravel. The trail is eminently reachable via Metra trains. 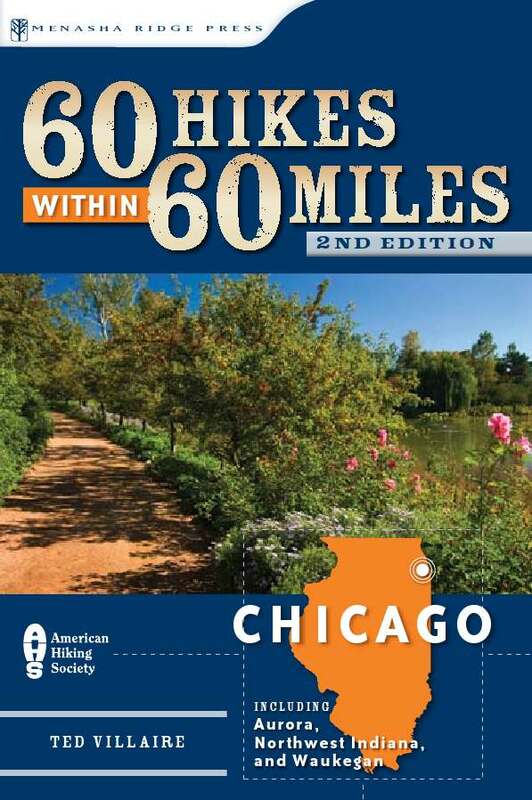 Ted Villaire, the author of this post, is also the author of 60 Hikes within 60 Miles: Chicago (now available in a second edition). As a cyclist, what should you do if you’re in a crash with a car on Chicago streets? My friend Jim Freeman knows. He’s a personal injury lawyer whose clients are primarily Chicago cyclists and pedestrians. Recently, he answered some of my questions about steps to take after a crash, bike safety, and local bike laws. Here’s what he had to say. What are the steps a cyclist should take after a crash? 2. Get witness and driver information. Do not depend on the police to get information from witnesses. In almost every case that comes to me, the client will say, “There were lots of witnesses, but I didn’t get any information from them. It should be on the police report.” In most instances, I get the police report and there are no witnesses listed. In a case where the question of fault depends on your word against theirs, an independent witness makes all the difference. So be sure to get any witness’ phone numbers and addresses. 3. Seek medical attention. If there is even the slightest possibility of an injury, you should request an ambulance and go to the emergency room. Adrenaline runs high after a crash, so you might think you are fine; but often there are latent injuries that are not immediately apparent. From a legal standpoint, it’s a good idea to seek medical attention at the scene of the crash. 4. Preserve evidence and take pictures. Your bicycle, clothing, helmet, and anything else damaged in the crash is evidence and should be preserved. Do not swap parts from your damaged bicycle. Leave it in its present condition and take pictures of the damaged bicycle and any visible injuries. In your experience, what are the most common reasons for car vs. bike crashes? About a third of my bicycle cases are “doorings.” Another third of my bicycle cases are “left turns” in which a cyclist is cut off or struck by a vehicle approaching from the opposite direction attempting a left turn. Regarding bike- and pedestrian-friendly laws, how does Chicago compare to other cities? The State of Illinois has some of the nation’s worst laws for cyclists. Cyclists are given a second class status. We are permitted to use Illinois roadways, but we are relegated to hugging the right hand curb, and we must yield to auto traffic under most circumstances. As a city, Chicago has gone a long way to promote cycling through infrastructure improvements and legislative improvements such as The Bicycle Safety Ordinance passed earlier this year. The Illinois Vehicle Code was clearly designed with only motorists in mind, not cyclists. The changes really need to come from Springfield to improve conditions for bicyclists statewide. Some states have much more favorable laws such as the stop sign/yield, red light/stop laws, which more realistically consider the practical differences between cyclists and motorists. What are the most important strategies for avoiding crashes on a bike? Headlights. Illinois law requires bicycles to be equipped with a white headlight and a red rear reflector. For some reason, cyclists in Chicago think it is acceptable to forgo headlights for a red rear light. If you are only going to have one light it should be a white headlight—not a red rear blinky. Lack of headlights kills more cases than all other factors combined. If a cyclist is involved in an accident with a motorist at night and the cyclist doesn’t have proper lighting equipment, the cyclist can expect to be blamed for the accident. Keep your eyes open and ride defensively. Understand that many motorists haven’t learned to look for cyclists. Assume they don’t see you or anticipate your presence. Stay out of the “door zone” and look into rear view mirrors of parked cars as you ride by. If you see someone in the car assume they are about to open their door. What’s your background in cycling and lawyering? I grew up in a small town in downstate Illinois. Like all the neighborhood kids I had a number of bikes over the years. In grade school I acquired my first road bike and started to spend time taking day trips in the country. The first few years of my undergraduate education were spent in the Ozark Mountains of Missouri, so I took up recreational mountain biking. I moved to Chicago in 1996, which lead to my first urban cycling experience. In 2002, when I moved to Logan Square, I discovered the joys of urban cycling and bicycle commuting, and I began to think of the bicycle as transportation rather than recreation. I became a religious year-round bicycle commuter and started racing. I also took a basic bicycle maintenance class, which marked the beginning of a more professional understanding of bicycle mechanics. In 2007, I took First Fixed, Second Overall in the Tour Da Chicago alleycat series, and I started teaching adult wheel building classes at West Town Bikes. After graduating from law school, I worked for a plaintiffs’ firm, representing injured people for two years. Then I went to work for a defense firm where I worked for insurance companies defending people or corporations alleged to have caused injuries. After four years of defense work, I left to start my own practice. I originally thought I would have a diverse practice, but fairly quickly I started getting calls from injured cyclists. Now, I have a busy practice consisting of different personal injury cases, but the overwhelming majority of my work involves advocating on behalf of bicyclists and pedestrians. 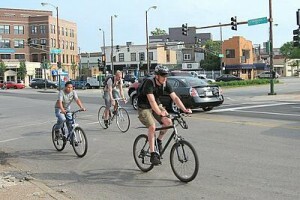 Read Jim Freeman’s blogs: The Streets of Chicago and Chicago Bicycle Laws. Chicago holds a central position on the migration route for millions of birds every spring and fall. About 250 bird species use the Mississippi Flyway, as it’s called, in the spring from mid-March to early June, and in autumn from late August to late October. While passing through Chicago, migrant birds use the city’s ponds, parks, and natural areas as resting and feeding stops. Migratory birds can be seen throughout the city, but most often, they turn up near the lakeshore. 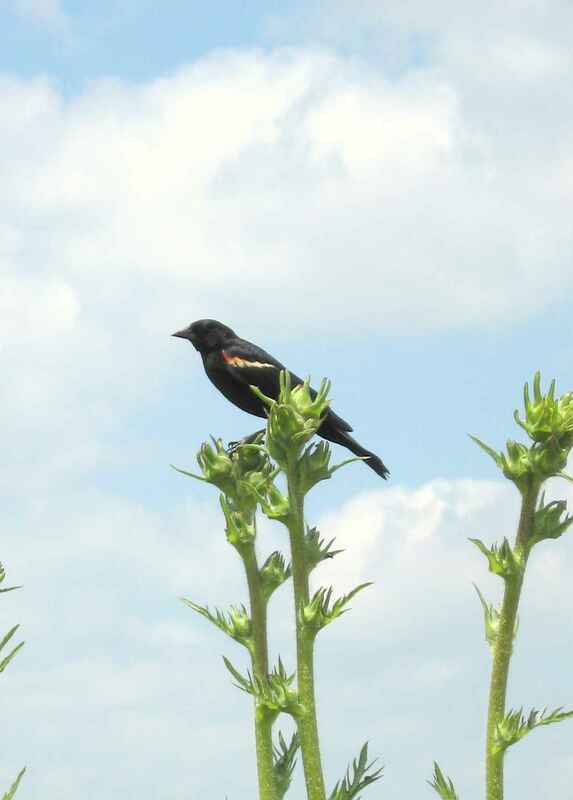 A couple of the best lakeshore spots for seeing the city’s avian visitors are Montrose Point and the Paul Douglas Nature Sanctuary in Jackson Park. Montrose Point, located just east of Montrose Beach, contains a 150-yard stretch of shrubs and trees often called the Magic Hedge. The hedge is well-loved by warblers, thrushes, sparrows, purple martins, woodpeckers, and dozens of other types of birds. Jackson Park’s Paul Douglas Nature Sanctuary (also called the Wooded Island) lures in scores of different species of migratory birds. The 16-acre island was created as part of the 1893 Columbian Exposition. While there, be sure to visit the lovely Osaka Garden. Learn more about exploring natural areas in the Chicago region by checking out 60 Hikes within 60 Miles: Chicago, recently available in a second edition. While it’s true that West Beach is one of the more popular destinations at the Indiana Dunes, it’s also true that you lose the crowds rather easily once you escape to the 3.6 miles of hiking trails that loop through the area. Located just 40 miles southeast of Chicago, West Beach is a perfect spot for a quick escape from the city. After you’re done climbing big dunes and scouting out water birds and unusual plants, you just might be compelled to pull out the picnic basket and change into your swim trunks (if the weather is warm enough, that is). If you’re a first-time visitor to the dunes, you’ll soon learn that this park occupies a very unlikely piece of real estate. Who would have thought to put a good-sized national park smack dab in the middle of an area with the highest concentration of heavy industry in the nation? Well, in any case, I’m glad they did. And once you’re away from the beach, the nearby smokestacks tend to be forgotten. Catch the hiking trail on the east side of the beach, and you’ll follow a long series of stairs and boardwalks that bring to mind the artwork of M.C. Escher. The stairs lead you to a series of high dunes topped with marram grass, jack pine, and cottonwood trees. 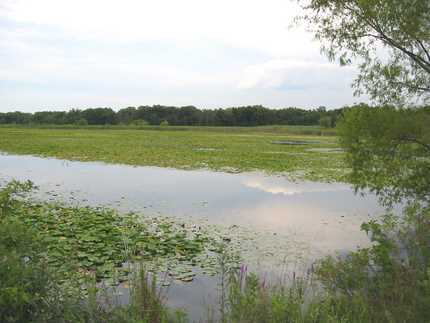 Coming off the dunes, the trail runs alongside a small lake fringed with cattails and blanketed with lily pads. Look for egrets, great blue herons, and kingfishers from the viewing deck alongside the trail. Near where the trail crosses the park road, prickly pear cactuses grow in dense clusters; closer to the woods, milkweed plants and small sassafras trees push up through the sandy soil. The final section of this trail climbs a dune ridge under a thick oak canopy. Small patches wetlands sit at the foot of some wooded ravines. Eventually, you’ll reach the top of the final dune for another spine-tingling view of the lake and the surrounding landscape. All that’s left now is running (or rolling) down the dune to the parking area below. The National Park Service offers driving directions and a good map of the trail. During summer, the park charges an entrance fee for West Beach. Learn more about hiking in the Chicago region by checking out 60 Hikes within 60 Miles: Chicago, recently published in a second edition. Perhaps the best place in the Midwest to experience the crescendo of fall color is the Morton Arboretum in Lisle. Right now at the arboretum, the sumacs and white ashes are showing reds and purples, shagbark hickory is putting on a golden-yellow display, while hints of oranges and reds are beginning to show in the tops of some of the sugar maples. In the arboretum’s 100-acre prairie, prairie grasses show russets, purples, and yellows with late asters blooming for added color. By this weekend, the kings of fall color-the maples-will likely arrive with their striking golds, reds, and oranges. Also stealing the spotlight are ginkgos, with megawatt yellow leaves so bright, you might think the trees are plugged into an electrical outlet. Sweet gums usually bring a dark red or purple, while corktrees, black maples and larches round out the palette. Free wine tasting offered by Bonterra organic vineyards; through October on weekends from 11 a.m.-4 p.m. The Fall Garden Marketplace offers an array of merchandise; through October on weekends. A Scarecrow Trail features nature-themed scarecrows designed by local Girl Scout troops; through October-8 a.m.-6 p.m. daily. A taffy apple bar; through October on weekends. While at the arboretum, visitors can hike 16 miles of trails, bicycle nine miles of roads, or take a 50-minute, narrated tram tour. The arboretum also hosts a restaurant with a great view. Admission to the arboretum is free for members; for nonmembers, admission is $9; children are $6. I will be signing copies of the new edition of my book, 60 Hikes within 60 Miles: Chicago, at the Arboretum’s Fall Garden Marketplace on Saturday, October 18, 11 a.m.-2:30 p.m.
Fall provides the perfect excuse to explore local trails: moderate temperatures, migrating birds, and a dormant bug population make the explosion of color all that more enjoyable. Here in the Prairie State, early fall is also the time when you can hike through a sea of prairie grass that is 8 to 10 feet tall. 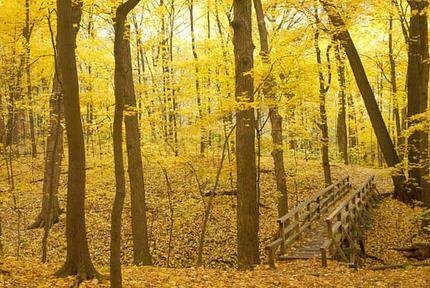 Here are several great fall hiking options in the Chicago area. The rugged trails on the west side of the park contain dense woods, wetlands active with water birds, and some of the biggest hills in Lake County. In early fall, swaths of big bluestem prairie grass reach 8-to-10 feet in height. Named for its attractive mauve stalks, big bluestem is the dominant grass of tallgrass prairies-the type of prairie that originally existed throughout the northern three-quarters of Illinois. Trails on the east side of the park meet up with the Fox River and Grass Lake, and allow fine views of the exquisite Fox River wetlands. 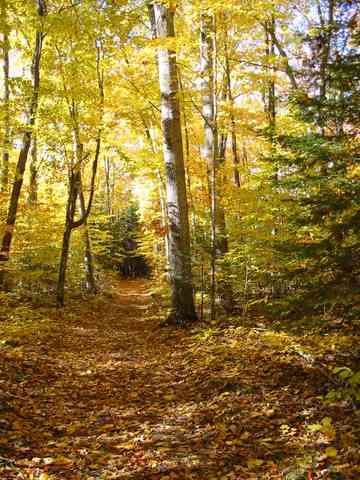 Explore nearly 15 miles of trails at this park located in Lake County near the Wisconsin border. Given the exclusive atmosphere at Geneva Lake, many visitors are surprised to learn that there’s a public footpath circumnavigating the entire lake. While walking through people’s yards may feel intrusive at first, this feeling diminishes once you see the many pleasant walkways installed by homeowners. Along the way, you’ll encounter flower gardens, carefully landscaped lawns, boathouses, and little villages. In the fall, the hills and bluffs surrounding this silvery lake light up with color. Consider starting at the Lake Geneva Library and taking a 10-mile walk to the village of Fontana. For the return trip, catch a tour boat back to your starting point. Geneva Lake is located about 10 miles north of Harvard, Ill. in Walworth County, Wis. If you enjoy hikes through hilly terrain crisscrossed with intermittent streams and blanketed with dense woods, you’ll be charmed by this 3-mile hike in southwestern McHenry County. Situated up on a ridge left by the last glacier, this wonderfully wooded landscape provides visitors with an unusually isolated atmosphere. The park’s 15 species of conifers don’t offer much color-wise, but they do provide a rich fragrance rarely encountered in the Chicago region. The hillsides of oak, hickory, poplar, sumac, and ash trees guarantee an abundance of fall color. Consider pitching a tent in the park’s small campground. Learn more about hiking in the Chicago region by checking out 60 Hikes within 60 Miles: Chicago, recently published in a second edition. A different version of this article first appeared in the September 2008 issue of Windy City Sports magazine. Prairie Fever is powered by	WordPress 3.5.1 and delivered to you in 0.279 seconds using 29 queries.